The Campbell Hausfeld 3 1/2-inch clipped head framing air nailer kit (NS349099AV) is designed for construction projects. 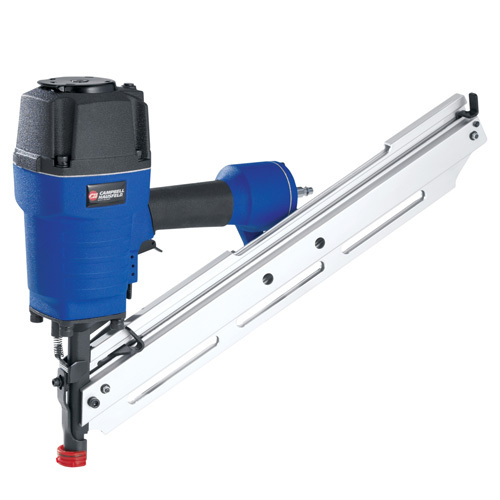 This air nailer lets the user easily change the direction of the exhaust and control the depth that the nail is driven in various types of wood and engineered lumber. The removable, non-marring tip protects finished wood surfaces. Features a serrated metal hose for aggressive toe nailing. Includes a 1/4-inch NPT industrial-style plug, (4) Allen wrenches, a bottle of nailer oil and a high-impact carrying case.